Would you be disappointed if you were promoted to first class on an airplane? How about if your window unit air conditioner were swapped out for central air? Would you protest if your $20 dinner voucher was raised to $50? I didn't think so. After all, who doesn't like upgrades? That question took on added relevance in the radiology world when NVIDIA unveiled its Project Clara in March. The company is applying its GPU—think high-end video gaming—and AI expertise to radiology graphics and workflow in multiple modalities, including CT, MRI, and ultrasound. 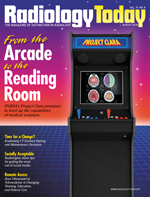 For this month's cover feature, Kathy Hardy details the project's genesis. With state-of-the-art graphics and cloud-based updates, NVIDIA is hoping that radiology departments will take advantage of the upgraded viewing capabilities that Project Clara offers. Speaking of upgrades, managing radiology equipment life cycles is an important aspect of a radiology director's job. Knowing when the cost of repairs exceeds the value of new equipment is a perpetual balancing act. Equally important is the need for service contracts that meet your department's needs. What works for one facility may not work for another. Beth W. Orenstein speaks with some experts to get their perspectives on the most effective ways to deal with these issues. As radiology advances along the technology curve, the ways in which radiology practitioners interact with technology will need to change as well. An example of that change can be found in Gail Snyder's article about social media. It seems like social media has more flavors than Baskin-Robbins these days, but each outlet appeals to a different audience, which necessitates tailoring interactions to fit the medium. The radiologists interviewed for the article shared their strategies for getting the most out of social media and making stronger connections with the wider radiology and patient communities. Stronger connections and more effective communication are also at the heart of teleradiology. As the need for subspecialists grows and the availability of health services in rural areas dwindles, teleradiology seems poised to fill the vacuum. Keith Loria reports on advances in teleultrasound technology that may vastly expand its use. The capability of a radiologist to remotely direct onsite medical personnel in obtaining images and then evaluate those images in real time enables possibilities for better triage and overall patient care, as well as more effective training and education.